Consistent. Robust. Encouraging. Such words have often been used to describe the United States’ recent job growth trends. After all, from July to November, 161,800 jobs were added to the national economy per month, on average. Even Superstorm Sandy did not damper the nation’s steady rise in employment, as 161,000 new jobs were generated in November, just days after the storm struck the northeastern United States. As 2012 drew to a close, a majority of economists were convinced that hiring would continue to upswing at a steady pace in December, predicting roughly 150,000 jobs would be created throughout the month. Their projections were virtually accurate. According to the BLS’ “The Employment Situation – December 2012,” the economy added 155,000 new jobs last month, as the national unemployment rate remained unchanged, at 7.8 percent, nearly a four-year low. The nation’s recent, steady employment figures resulted in a yearly total of 1.84 million new jobs in 2012, a monthly average of 153,000, which matched 2011’s total job creation. Although public sector hiring dwindled throughout President Obama’s first term, the United States’ private sector has now added new jobs to the economy for 34 straight months – a total of 5.8 million jobs during that period. In addition, the average workweek increased to 34.5 hours last month, while the average hourly earnings of private non-farm payroll employees rose to $23.73, an upsurge of 2.1 percent since December 2011. A total of 168,000 new private sector jobs were created last month, as the following industries reported a rise in employment. 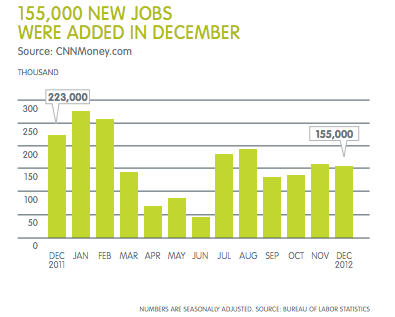 Engineering and Architecture: The sector generated 3,800 new jobs in December, the highest monthly total since April. Throughout the last 12 months, sector hiring has increased by 33,900. Finance: For the 11th straight month, the sector reported a rise in hiring in December, while adding 9,000 new jobs to the national economy. In all, 7.8 million finance professionals were employed. Healthcare: Sector hiring picked up in December as 44,500 professionals were offered new employment opportunities. In the last year, 337,700 healthcare workers have been hired. Manufacturing: As a surprise to national economic experts, sector hiring actually rebounded in December, as 25,000 jobs were added to the economy. From August to November, the sector lost an average of 25,000 jobs per month, leading some economists to anticipate a similar trend last month. Professional and Business Services: Sector hiring rose for the seventh successive month in December, as 19,000 new jobs were generated. Employment has increased by 472,000 since December 2011. The requirement for employers to provide health benefits to employees is a cornerstone of the new law, but the new rules proposed by the Internal Revenue Service said that employers’ obligation was to provide affordable insurance to cover their full-time employees. The rules offer no guarantee of affordable insurance for a worker’s children or spouse. To avoid a possible tax penalty, the government said, employers with 50 or more full-time employees must offer affordable coverage to those employees. In an effort to unlock tax revenue, not just raise rates on the wealthy, architects of the fiscal cliff deal handed certain retirement savers a small bonus: You can now convert traditional 401(k) plan assets into a Roth 401(k) regardless of age and employment status. Under the old rules, to convert you typically had to leave your job, retire, become disabled, or reach age 59½ and be eligible for normal distributions. So this is welcome flexibility, though it won’t be available to everybody. 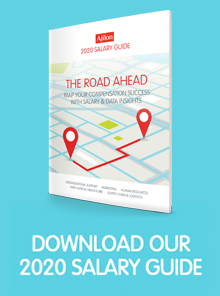 Only 40% of employers offer a Roth 401(k) in the first place, and not all of those plans allow conversions. But at those that do, there is now nothing to stop you from making the switch.